After surveying all the different stalls open, we settled on first getting some Venezuelan food from Arepa & Co. The store advertises itself as The Cornbread House, but their cornbread aren’t the ones you eat at Thanksgiving. 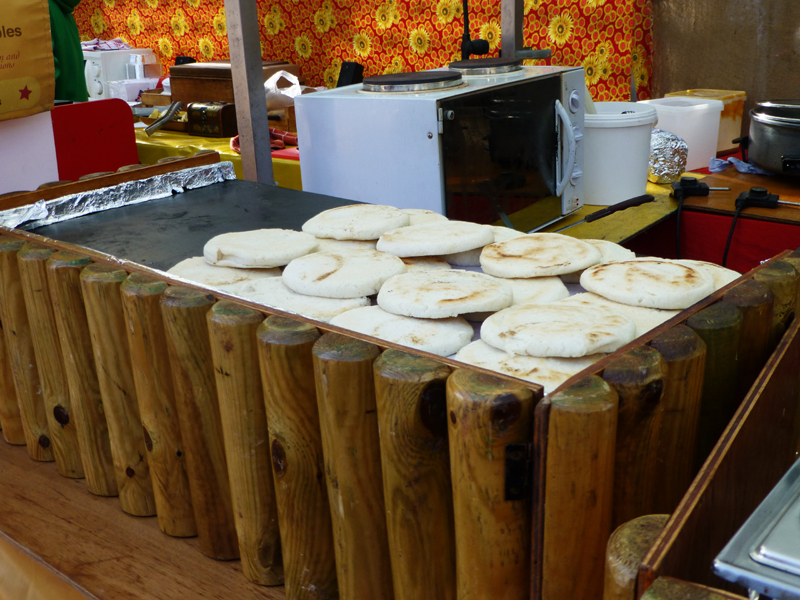 They are grilled disks of dough that have no yeast or dairy. 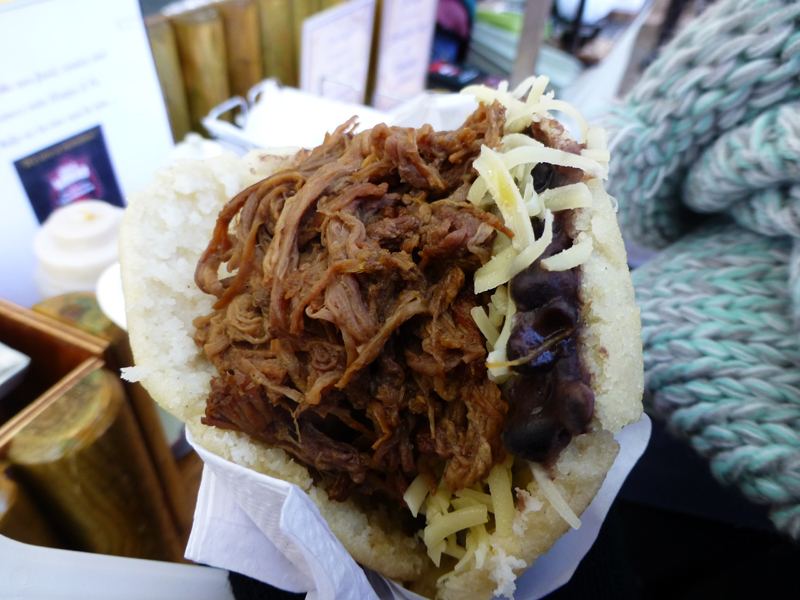 For £5, we shared an arepa, which consists of a cornbread filled with your choice of 6 different fillings. But with so many different combinations that can be made with yummy fillings such as chicken avocado and plantains, we just couldn’t decide. The owner was nice, though, and let us sample the fillings. Eventually, we went with the owner’s recommendation – beef, black beans, and cheese. They were generous with the filling and the crispy cornbread was so good I’m sure that any of the stand’s filling would have been fantastic when eaten with it. Arepa & Co also sells just their cornbread, so you can buy a whole bunch and toast them whenever you want. The arepa was so filling and tasty; I hope the owner fulfills his dream of opening a location in New York. Check out the shop’s website here! With one dish down, we decided it was time for something sweet. Not far from Arepa & Co, we found our desired dessert, churros. 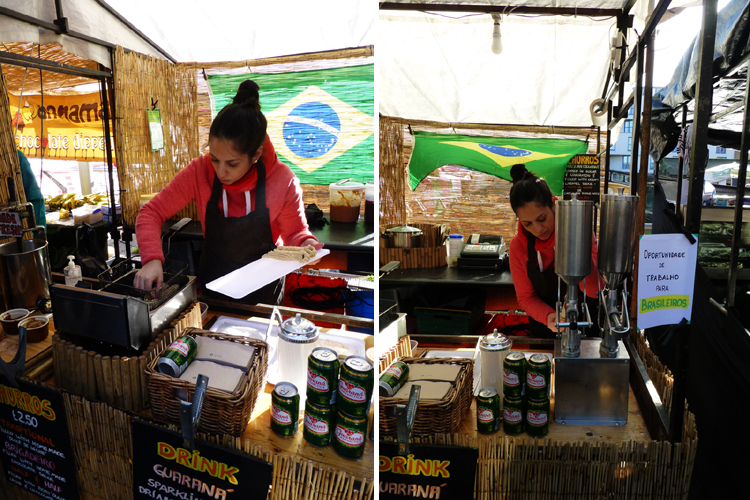 The Brazilian churro stand sold three types of churros, all for £2.50. The Traditional is filled with homemade dulce de leche. The Brigadeiro is filled with homemade chocolate sauce, and the Half & Half is filled with both sauces. I didn’t get to see how the churro was made, but my friend was kind enough to help me take pictures. The lady first churned out the dough from a machine designed to make the hole and grooves. Then she fried it, coated it in a generous amount of sugar, and then injected the sauce inside. We went with the Traditional and were not disappointed. The foot-long, crisp doughnut had dulce de leche oozing from both ends. 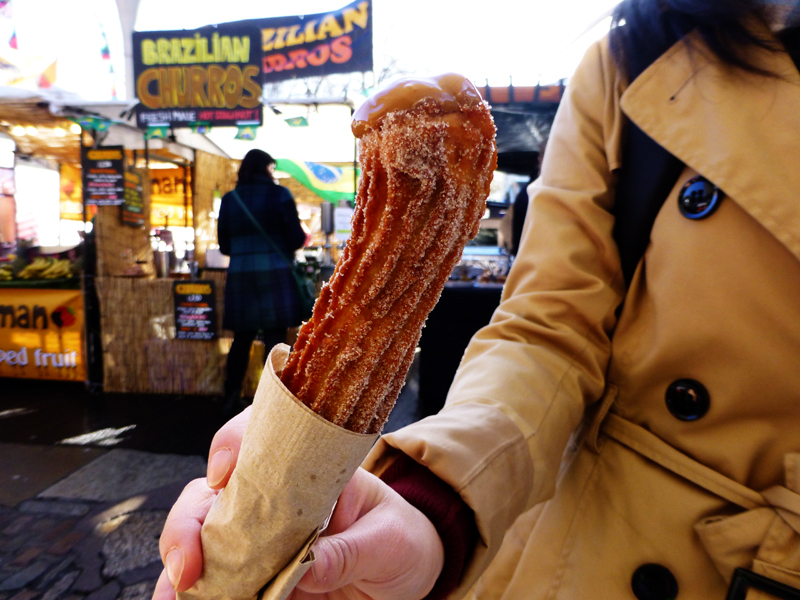 The dulce de leche wasn’t overly sweet, making eating the churro much more manageable to eat. Each churro is made fresh, and there’s nothing like a yummy and warm treat. 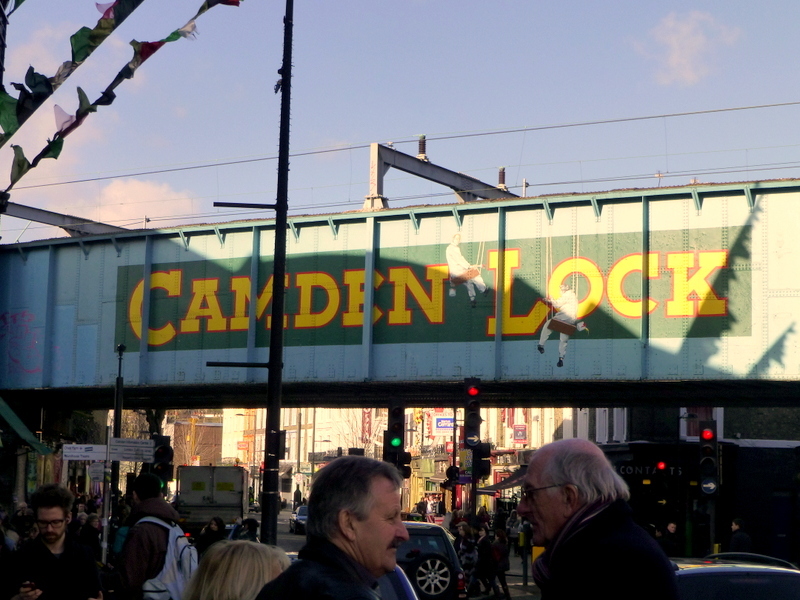 Outdoor food markets are always fun to explore. The only disappointment is that you can only try a few before your poor, bloated stomach tells you to stop! Which can only mean that we have to return again.